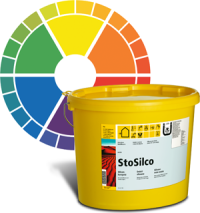 Following a product development programme, StoSilco render is now available in an extended colour range of 764 colours from the StoColor System. StoSilco is a silicone resin base render with advanced water shedding capabilities, making it resistant to aggressive atmospheres and algae growth. The addition of an improved binder has provided increased resistance to the fading of intense colours, so now a further 275 colours are possible. Please note that these changes currently only apply to StoSilco K/R/MP renders. These changes do not apply to the StoSilco QS renders for winter working, StoSilco Color paints or other silicone resin products.